Last week we got our first glimpse of the Michael Bay-produced Teenage Mutant Ninja Turtles reboot. While the trailer certainly gave us an exciting look at what to expect, we didn’t get to see much of the Ninja Turtles talking. We did see Michelangelo talking to April at the end of the trailer, and we saw a brief exchange between Donatello and Raphael. The two most notable voices absent, though, were those of Splinter and Leonardo. Today, we have word of who will be providing the voices for those two main characters, and one of the choices is shocking to say the least. 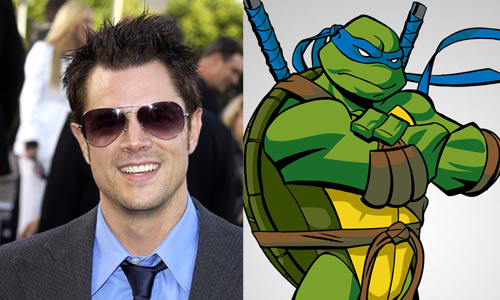 Johnny Knoxville (Jackass, Bad Grandpa) has been signed on to voice the turtle leader, Leonardo, while Tony Shalhoub will voice Splinter. Shalhoub’s voice makes sense (somewhat) but the addition of Knoxville makes almost no sense at all. Hell, I’d even be against Knoxville voicing turtle party boy Michelangelo. Knoxville has a strange voice to begin with and it’s not exactly one that commands respect. Now, if he was ordering the turtles to dutch oven an old lady while dressed as Union soldiers from the Civil War, I’d be all for it. We’ll have to wait until the next trailer to see how all this unfolds, but let’s just say this casting makes Ben Affleck as Batman seem like a no-brainer.